Lesson – a piece of instruction, a reading or exercise to be studied by a pupil, a division of a course of instruction, something learned by study or experience. Aside from the actual definitions of the two words, let’s look a little deeper. Professional athletes have coaches, most youth programs have coaches, most sports in general have coaches, yet the average golfer doesn’t have a coach. At best they take an occasional golf lesson…or worse, attempt to diagnose and fix their own swing. Most golfers are fixers instead of improvers. Somewhere in the golf industry we’ve failed golfers because we’ve led them to believe they are just one golf tip away from “fixing their swing” and reaching their goals. Unfortunately, this assumption could not be further from the truth. Yes a golf tip or two can be helpful, but golf tips never really stick and represent only a very small piece of your game. A coach has the ability to tell you why you are not shooting the scores you want to be shooting, identify the areas that need improvement, make changes to the areas that will have the biggest impact on your game, and then continue to build upon those skills to help you reach your goal. A good coach will truly help your game improve. 1. If you are feeling sick, would you march into the doctor’s office and demand a certain remedy based on what you have decided is wrong with you, or would you ask the doctor why you are feeling this way and then proceed through different tests to truly find out why you are sick? What if you had a pain in your arm and decided you pulled a muscle but it turned out to be symptoms of a heart attack? Lessons correct symptoms while coaching helps to diagnose the underlying problems and create a plan for improvement. 2. Would you ever walk into a pharmacy and take the first drug you see? If you took the wrong drug, it might not help at all…or could even kill you? Self diagnosis combined with self correction can be deadly. There are many ways to swing a golf club and each way has compatible and incompatible pieces. Choose the wrong fix and it could make everything worse…and you could even injure yourself. 3. Would you take your car to the mechanic to get a strange noise fixed and then not change your oil for 50,000 miles? Even when you make changes, it’s good to keep up with maintenance on your game. You never know what problems might creep in if you don’t perform regular maintenance, and Murphy’s Law states that it will most likely blow up at the worst possible moment. Coaching often looks beyond the golf swing because there are many factors that can affect performance. A half hour lesson can only address so much. It is the coaching relationship that allows for true diagnosis of underlying causes of poor performance. How can you be sure that the reason you don’t play well on the back nine is because you didn’t swing your driver well? With long-term students I often find that the area where they are struggling is not just caused by their inability to swing the driver well on the back nine, but a combination of many things that causes them not to drive the ball well on the back nine. Maybe they don’t drink enough water, they don’t fuel their body correctly, their legs get tired, they are using an improperly fitted driver, they start focusing on their score instead of the shot at hand, they make an incorrect club/strategy choice, they don’t account for an increase in wind speed, their mind starts to wander to what they need to do after the round, or they tell themselves they never drive well on the back nine creating fear and anxiety over the ball. If they only work on their swing with the driver they may never identify the underlying cause of why they actually don’t hit their driver well on the back nine. It is the student-coach relationship that allows for correct identification of the challenges that causes a student to not perform as expected and for improvements to be made over time. Yes, maybe there is a change that needs to be made to their swing, but often times there are unidentified issues that have a huge impact on their ability to succeed. Coaching golf is complicated – for the coach, not the student. It takes years of education from a playing and teaching standpoint to be a great coach. 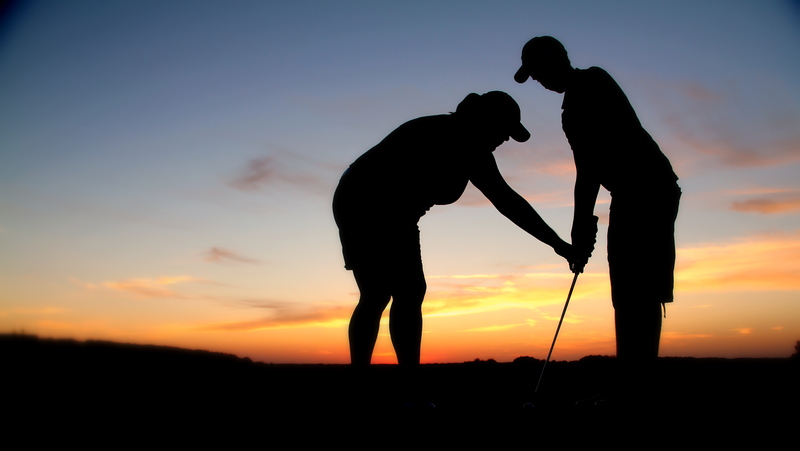 A golf coach has to not only learn what it truly takes to improve at golf, but they also have to develop a relationship with their student over time that will allow them to learn about their student’s game and then tailor a plan that will help that individual student improve. Once you find a great coach, you will have a consultant and a friend (who truly understands you and your game) to guide you along your journey to an improved game. You will work side-by-side with your coach to help create your unique road map to success – factoring in your personal preferences and styles for learning. I ask that you approach your game improvement as an investment – one that can truly help you reach your goals. Before spending $300 on a new driver or $800 on a new set of irons, ask yourself if your money would be better spent by learning which areas of your game you need to improve and creating a plan to improve them. Remember – golf clubs are the only thing you will ever spend hundreds of dollars on that don’t come with an instruction manual on how to use them. Give yourself the gift of better golf today and invest in a good coach. What can a better game do for you? I’m emailing you to make a confession…I hung up my clubs towards the end of last summer. I’m not proud of it, but that’s the truth. I got frustrated with continuing to make the same mistakes despite my efforts to change. I think I spent too much time on the range and not enough time playing, so I wasn’t able to take my range swing to the course. I could ramble on about my various reasons for hanging the clubs up, but that’s it in a nutshell. I’m not sure what I’m going to do next season. I enjoy the game at times and it is a part of our family, so really quiting permanently isn’t what I want to do. I’m getting the impression from your recent emails I’ve got to deal with my mental game before I can get my golf swing in shape. Obviously, there are some issues there (you think??). So that’s it. I need to come out next season with a different outlook….any suggestions? Trish, you are an amazing person and can do anything you set your mind to. Many golfers struggle with taking their game to the course for various reasons. I think we need to sit down and revisit your goals and the process of how you are going about trying to achieve those goals. First of all, we need to get you on the course more. Remember when you are on the course, you are playing golf….not perfect golf-swing. Next we need to reframe problems as challenges. Keep golf a game! I think it’s also important that you take time on the course to appreciate the things around you. If you appreciate your family, the day, the scenery, etc. you are less likely to stand over shots in fear that you are going to “mess it up”. I also need to introduce you to the HeartMath Program. It will help you learn the relationship between emotions, stress, and performance, and it will provide you the tools to help you center yourself, make better decisions, and monitor your self talk on the course to produce a positive outcome! This stuff is amazing and life/game changing! Also, my final and most important rule. If you wouldn’t say something to someone else (i.e. your kids), you can’t say it to yourself. Be your own best coach instead of your worst critic. I’ll be in touch to get you back on track and loving golf again!